Autobahn California 63mm Rollen 4 Stk. Caliber is known for making stable trucks that are great at speeds. Well, this 50° edition certainly does not stray from its origins. But with the altered angle, you also add a dimension of turnability and control in tight cornering moves. This is sought after specifically when riding pumping/carving setups and longboards where you utilize the turning to get that asphalt surfing feel. A solid choice for the freestyle/dance trend that is currently popular. This Caliber II 9" 50° is born with a set of barrel-cone bushings which further enhance the turnability. The bushings are Blood Orange bushings with Ultra High Rebound Polyurethane with a durometer of 89A. 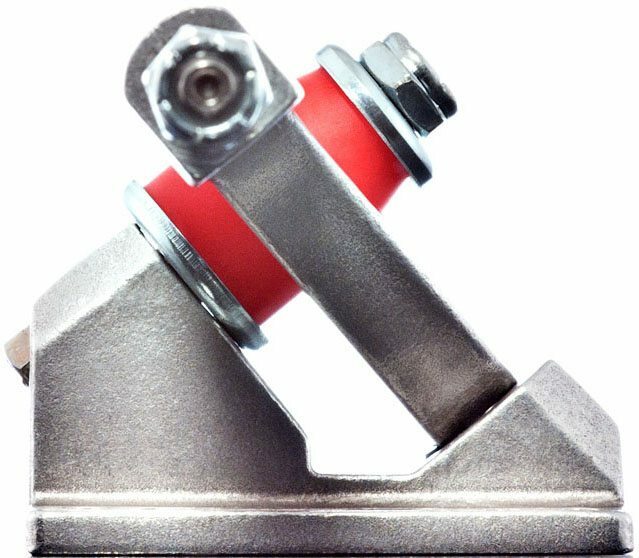 Like all Caliber Trucks, the kingpin is made of grade 8 steel to ensure your trucks will stay in one piece, no matter how hard you push them. Caliber Small Cupped Washer 2 Stk.